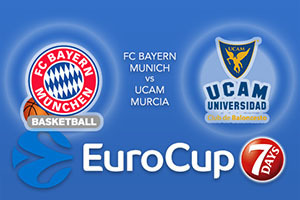 This is the first time these two teams have clashed which means that there is another first for the Eurocup this week. Games between German and Spanish sides should always be a good example of attacking basketball and there are high hopes that this will be a game to look back on fondly. One home player that will be very much looking forward to this game is Anton Gavel. This is because Gavel played for Murcia for two tears between 2006 and 2008. Bayern lost out on the road last week although there is no shame in suffering a narrow loss to Zenit St Petersburg, The Germans went down by a score of 80-77. Devin Brooker had an excellent game for Bayern in that match and he managed to deliver a total of 27 points, 5 assists and 8 rebounds. This was the highest ranked performance of the opening week of the Eurocup and another along those lines would be very welcome for Bayern fans. UCAM got off to an excellent start in their opening game of the Eurocup, winning 86-77 at home to Budocnost. It will likely be a tougher tie in this game and they know that they are facing a team who will have a noisy and passionate crowd behind them. One player who will be looking to play well is Facu Campazzo and he managed to provide 8 assists in the win. Vitor Benite offered up 15 points in the win while Pedro Llompart grabbed 13 points in the game. If these players deliver, it is likely to be a massive game for the away team. It can be difficult to predict this game as both teams will feel they have a strong chance of winning the game. Look to UCAM Murcia at +6.5, which is provided at odds of 1.90. If you have an interest in the Over/Under market for this Eurocup game, you should be looking at UNDER 160.0 which is provided at odds of 1.90 for this Wednesday night match. Bet Now!